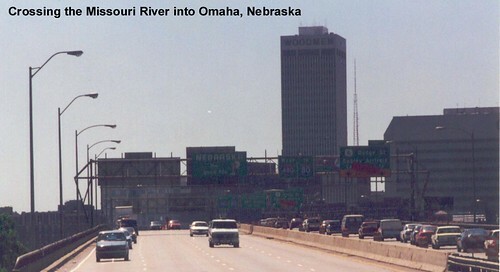 US 6 enters Nebraska at Omaha. 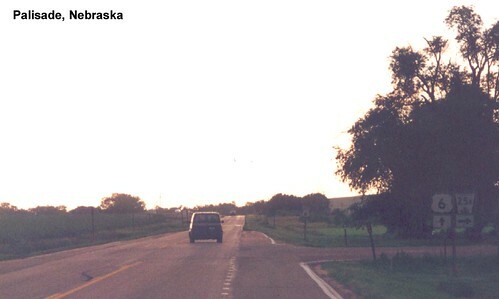 A four-lane section of US 6 in Nebraska, with a freight train running along side us to the right. I-80 provides a nearby alternative, leaving US 6 a quiet country highway. More farms as US 6 passes through Grafton. US 34 rejoins US 6 at Hastings. I remember seeing bunkers along US 6 to the east of Hastings on my first trip through this area. US 6 in Harlan County. US 6 is multiplexed with US 34 across much of the state. I spent the night in McCook on at least one of my trips. An evening shot of US 6 in Palisade. US 6 heading west toward Colorado.